Mumbai: Benchmark equity indexes Sensex and Nifty fell the most in nearly six months to their lowest close in six weeks as trade war tensions kept world markets on edge. The rupee hit a new record low against the dollar, rattling investor sentiment. The BSE’s 30-share Sensex fell 1.34%, or 509.04 points, to 37,413.13 points, while the National Stock Exchange’s 50-share Nifty fell 1.32% to close at 11,287.50 points. It was the biggest fall for both indices since 16 March, and the lowest close since 2 August. 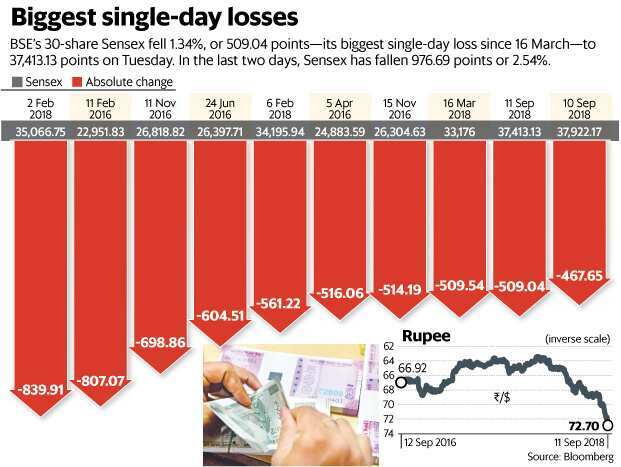 In the last two days, the Sensex has fallen 976.69 points or 2.54%. Trade war tensions, a weakening rupee, and rising crude oil prices hurt investor sentiment. Going ahead, the movement of the rupee and macro data will play a key role in market direction. On Tuesday, the Indian rupee tumbled to a fresh record low of 72.74 against the dollar. It shed 0.34% during the day to close at 72.70. Brent crude gained 0.67% to trade at $77.89 per barrel. It has risen 16.48% so far in 2018. “The combination of higher crude oil prices, bond yields and rupee are responsible for the negative sentiment. Talks of trade wars added to the woes," said Hemang Jani, head, advisory, at retail-focused brokerage Sharekhan, owned by BNP Paribas. Bond yields spiked further, tracking weakness in the currency. The 10-year bond yield closed at 8.184%, the highest since November 2014, from Monday’s close of 8.158%. “The bond market is analysing the measures that RBI will take to stem the rupee. The depreciation in rupee over the last five sessions has been momentum driven rather than fundamental or dollar strengthening sessions. The market has already priced in a 50 basis points rate hike in the next policy or maybe before that," said Jayesh Mehta, head of treasury at Bank of America-Merrill Lynch. Net inflows into domestic mutual funds dropped 11.39% to ₹ 8,375 crore in August—a five-month low— because of the uncertainties in the market. Inflows from domestic institutional investors (DIIs), which have been the key driver for the equity market this year, dropped to their lowest since January, in August. Year to date, DIIs infused ₹ 70,531.49 crore in Indian equities. “The slowdown in flows is apparent and not lending support to the market," Jani of Sharekhan added. Foreign institutional investors (FIIs) have been net sellers with the year to date with net sales of $465.62 million. “There is also a concern on how will the recently-aggressive set of NBFCs deal with the sudden spike in bond yields, and the continued volatility on that front," said Jani. However, the long-term perspective for the market stayed positive. “We need to remember that India has still outperformed the Asia/EM (emerging market) pack for last few months," said Vaibhav Sanghavi, co-chief executive officer of Avendus Capital Public Markets Alternative Strategies LLP.